Op zoek zu Skitouren in Russland? Russisch Lappland ist prachtig und vol mit verrasingen. What about guide and accommodation? Our experienced guide will guide, cook and give all information which you like to know. Overnights during the cross-country ski holidays will be in simple houses in small villages, mountain guesthouses, spa hotels and in the cities in hotels. Our cross-country ski holidays start in the centre of the Kola Peninsula where the magnificent Khibiny Tundra is situated. You can find out the difference between the Russian banya and the Scandinavian sauna. 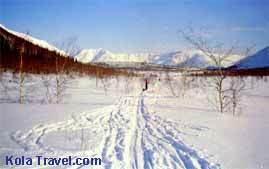 Try Winter Adventure behind the Polar Circle in Russia! 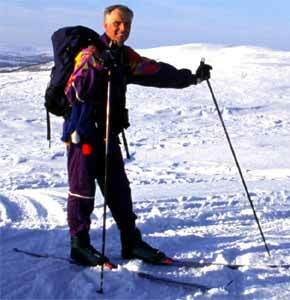 Ski through Polar night from to places where you have never been before. During December and January the forest, mountains and tundra are shrouded in darkness, with only the occasional ghostly illumination of Northern Lights, stars and moon reflecting off the white snow. But by March the sunlight can be dazzling in its brightness, and temperatures have finally started to rise. This is an excellent time to come for a skiing adventure, to skim over frozen lakes and along river corridors in fir forests - and to spend a few nights in a comfortable lodge nestled in the Russian wilderness. Explore the Winter World of Kola Peninsula in Khibiny Mountains! And while you’re here, why not get acquainted with some of the Kola’s unusual cities and towns as well? Luggage transport during your skiing holiday! During the cross-country ski holidays there will be luggage transport and you will ski along the tracks of the snowmobile. The snowmobile will be far in front of the group. On the skiing route there are several stops for having rest. 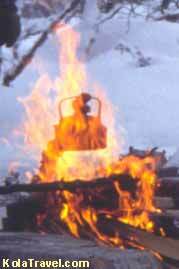 The snowmobile guide has prepared a campfire and offers sandwiches and hot drinks. From the second week von January weekly until end von April starting von Saturday zu Saturday. Click here für asking start dates! •4 days program incl. registration und 3 nachts in hotel: 04.04 - 07.04.